There is a set of 40 place settings of regular porcelain plates, salad plates, soup bowls and cereal bowls as well as plastic ones for outdoor dining in the kitchen cabinets. Another cabinet is full of glasses, mugs and cups in different materiels, and we have two full sets of silverware (a total of 200+ pieces) so you can entertain and feed a large group. After you are done, you use the dishwasher to clean the dishes while you relax. The house is stocked with lots of tools and appliances for the kitchen. We have several coffee makers, toasters, blenders, crock pots, microwaves, hand mixers and food processors. We have corkscrews, an electric can opener and several manual ones, baking and mixing sets plus lots of tools like potato mashers and meat tenderizers. The controls for the dual oven convection oven. 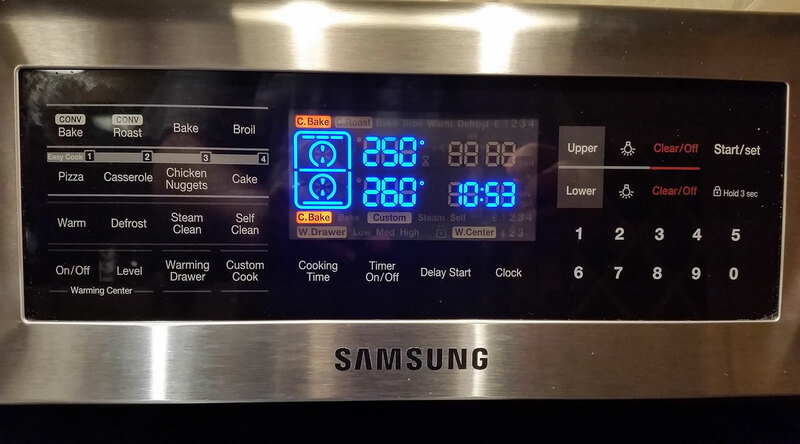 The range/oven in the kitchen is new in 2015. It is a smooth electric cooktop with flexible dual oven configuration. A special removable divider (the “smart divider”) fits in the middle of the oven to create two cavities – upper and lower – that can heat to different temperatures and cook different recipes at the same time if you wish. Both ovens can also do convection bake. We have different sets of pots and pans in the house – mostly hard anodized and nonstick with a few stainless pans. There are also baking pans, cookie sheets and pans for cakes and brownies. You shouldn’t have any problem finding what you need to cook for your group. Having to bring or buy spices and condiments on vacation is annoying. It makes packing stressful and does not start the trip out on the right foot. Having been there ourselves we provide guests with a set of the most common (and some uncommon) spices for your use. We even have this list of what we provide. 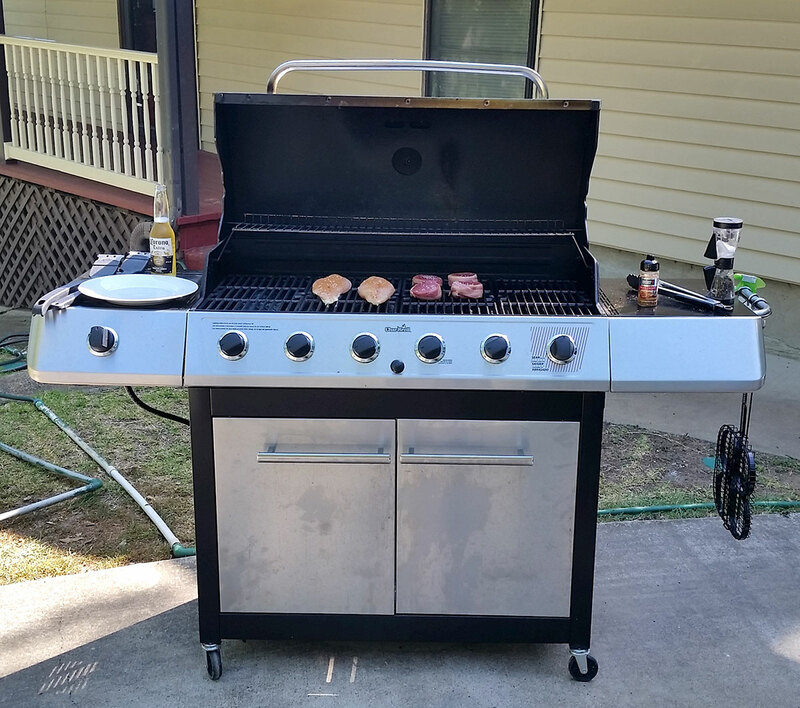 No vacation is complete without a grill to prepare steaks, hamburgers, hot dogs or other food. 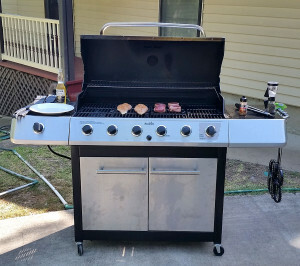 You have access to a large 6-burner gas grill complete with grill tool. The kitchen even contains non-flamable spray for the grates, as well as spice mixes for grilling. Imaging coming back from a day of fishing on the lake and then grilling your catch right away. It does not get fresher than that!